Two weeks earlier, the board voted unanimously to remove the “Children of the Confederacy Creed” plaque, which falsely states that the Civil War was “not a rebellion, nor was its underlying cause to sustain slavery,” from its location near the Capitol rotunda. The board did not determine a final location for the plaque Friday but unanimously voted in favor of a motion to temporarily store the plaque in the Capitol collection — which consists of artifacts from the Capitol and state history — and allow a 90-day period for public comment on where the plaque should end up. Abbott, along with Texas House Speaker Dennis Bonnen and Lt. Gov. Dan Patrick, both Republicans who serve as co-vice chairs on the preservation board under Abbott, did not come to Friday’s meeting. All three sent top staffers to speak on their behalf. State Rep. Eric Johnson, D-Dallas, started the campaign against the plaque during the summer of 2017. 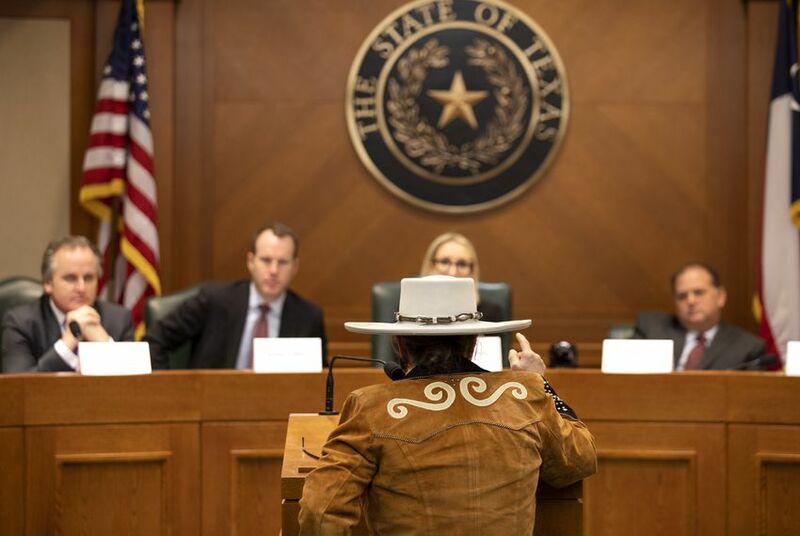 It recently drew support from prominent Texas Republicans, including Bonnen, former House Speaker Joe Straus and Land Commissioner George P. Bush. Contempt for the “Children of the Confederacy Creed” plaque, which was installed in 1959, garnered national attention. But it's far from the only Confederate symbol in Texas. In fact, it’s one of more than 200 scattered across the state and highlights just the latest example of Texas and its cities grappling with the question of whether these symbols should be removed. Texas is second in the country for having the most Confederate symbols, behind Virginia, according to the Southern Poverty Law Center. And the state Capitol isn’t the only place where there’s a debate taking place about taking these markers down and figuring out where they go next. In Dallas, officials still haven’t decided what to do with a Robert E. Lee statue that was removed from a city park more than a year ago. In San Antonio, the City Council voted 10-1 in September 2017 to remove a Confederate war memorial at Travis Park, but there’s still a heated debate taking place over where the monument should go next. Statues and plaques aren’t the only Confederate symbols across the state that’ve drawn contempt. Schools and roads named after men who served in the Confederacy are also under scrutiny, and heated discussions have taken place over what to do with the markers since a deadly white supremacist rally in Charlottesville, Virginia, in August 2017. The larger debate surrounding the plaque is about “what you do about correcting these perceptions of the present built on perceptions of the past,” said Walter Buenger, a history professor at the University of Texas at Austin. Many at Friday’s hearing, however, feared that the plaque was just the first of many symbols on Capitol grounds that would be removed in the coming months. Even without the small plaque on the wall, the Texas Capitol still displays monuments, cannons and portraits honoring the Confederacy. Johnson, meanwhile, said he hadn’t been consulted by State Preservation Board members on where the plaque should go next. He said he believes it has educational value, however, and suggested a state university or a museum would be “really appropriate” possible locations. Disclosure: The State Preservation Board and the University of Texas at Austin have been financial supporters of The Texas Tribune, a nonprofit, nonpartisan news organization that is funded in part by donations from members, foundations and corporate sponsors. Financial supporters play no role in the Tribune's journalism. Find a complete list of them here.